Tequila is the national drink of Mexico and is certainly one of the most popular spirit beverages in the world. Tequila is made from blue agave. and defined the landscape of our country, giving it a taste unmistakably linked to our identity. Its leaves are thick, fleshy, sharp, and– like cactus–store water in their interior in order to survive. There are over 200 species of agave of which almost all grow in Mexico. They vary in shape, size and color. The agave is such a rich plant that man has extracted from them fiber, paper, candy, vinegar, honey, sugar, and of course, three alcoholic beverages which are the pride of Mexico: tequila, mezcal and pulque. In pre-Columbian times the Aztecs revered a species of agave known as “maguey” (Agave Americana), which they considered to be representative of “Mayahuel”, the goddess of alcohol who fed her 400 children with pulque that emanated from her numerous breasts. Mayahuel was also associated with the moon, femininity, vegetation and its life cycles. 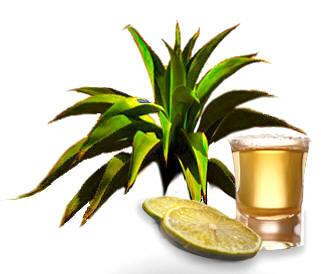 A sacred beverage was obtained from the agave which could only be enjoyed on special occasions by the tlatoanis or rulers, priests or the elders. This beverage is pulque, which still remains popular in certain Mexican regions, mainly in the state of Hidalgo. From another species known as henequen, from the Yucatan peninsula, the Mayans extracted a fiber to manufacture rope and rugs. Henequen was the engine for a huge industry in that zone at the end of the 19th century. Mezcal is produced from the combination of various species of agave, a typical spirit from the Oaxaca region, whose handmade manufacture is a source of wonder and enchantment for visitors to this region of Mexico. It’s called mezcal because that’s the name of the heart of the agave, from which a delicious honey is extracted. In the Nahuatl dialect, mezcal means, “The house of the moon” and conceptually refers to the core, the essence; the center of something. Finally, tequila is produced from blue agave or ‘Agave Tequiliana Weber’, the most famous drink in our country; an intensely flavored spirit associated with the lively and courageous character of the Mexican. It’s also an allegory of our history because it fuses the benefits of a native Mexican plant with the European techniques that Spain introduced during the colonial period. In Mexico tequila is synonymous with celebration, pride and complicity between friends. The best of times are enjoyed with a few shots of tequila; with tequila you toast for success and its also with tequila that you drown the pain of disillusionment. With a shot of tequila, unforgettable life stories are begun and with another we remember them!